MP for Mid Dorset and North Poole and co-chair of the Breast Cancer All Party Parliamentary Group, Annette Brooke, has joined leading UK charity Breakthrough Breast Cancer’s call to make the issue of access to drugs a top priority, and help put breast cancer back on the agenda. 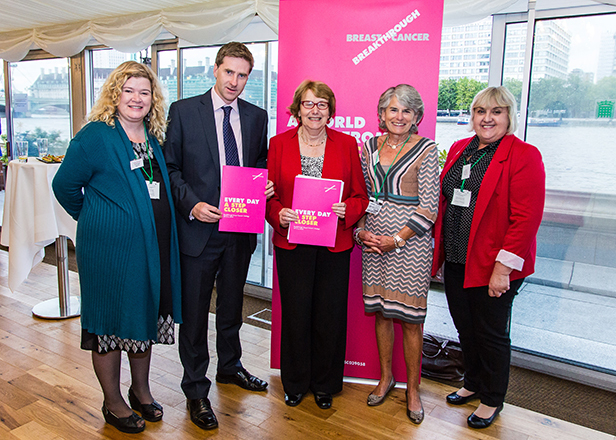 More than 70 MPs attended a reception hosted by Annette and Breakthrough Breast Cancer last week (Tuesday 8 October) at the House of Commons. There, the charity called on the Government to bring about a new focus on breast cancer, with a priority of introducing an equitable system through which effective new treatments are routinely made available to patients. Earlier this year Breakthrough expressed its disappointment that two effective metastatic breast cancer drugs, everolimus (also known as Afinitor), and pertuzumab (also known as Perjeta) were rejected by NICE on the basis of cost. Last month the Government announced a two-year extension of the Cancer Drugs Fund, an England-only fund through which patients can access drugs rejected – or not yet approved – by NICE for routine use on the NHS. Annette said, “Breast cancer is not yesterday’s problem; thousands of women in the UK are living with a diagnosis of secondary breast cancer, with incredibly limited treatment options. Research is developing treatments that can give women at the end of their lives more good quality time with their loved ones; we have a responsibility to ensure that there is a system that allows these pioneering new drugs to routinely reach patients who will benefit from them. Chris Askew, Chief Executive at Breakthrough Breast Cancer said, “The Government has a clear role to play in putting breast cancer back on the agenda and in ensuring that breast cancer patients can expect the best possible treatment for their disease. Researchers know that, with the right funding, it’s a question of when, not if, we beat this disease.